Boyz II Men on new album: "The canvas is completely different"
When Boyz II Men burst onto the scene with its debut album, "Cooleyhighharmony," in 1991, the guys were definitely closer to boys status than to their current men status. Now 23 years later, founding members Nathan Morris, Shawn Stockman and Wanya Morris say they're "men in a great space" -- and with that, not worried about fitting in. "We don't really have any obligations to labels per se or image or trying to fit in or trying to be a part of whatever trend of culture," Stockman, 41, told CBS News. "It's the best feeling in the world to have that freedom." The harmonious trio is exercising that freedom on the upcoming studio album, "Collide," due out Sept. 30. Two of the tracks, "Diamond Eyes" and "Better Half," have already been released via iTunes -- and Boyz II Men is eager for fans to hear its first new album since 2011's "Twenty." Known for R&B/pop hits "It's So Hard to Say Goodbye to Yesterday," "I'll Make Love To You" and "End of the Road," the members of Boyz II Men say they're not concerned with genres or categories; they just want to make and perform music that they love. These days, the members of Boyz II Men spend a good part of the year in Las Vegas, where they've set up a residency at the Mirage Hotel & Casino. The guys showed off their singing chops on Wednesday during an appearance in New York's Times Square as part of a partnership with Wendy's #PretzelLoveSongs campaign. Via a karaoke booth, they helped fans sing "pretzelfied" love song lyrics about a pretzel bun. Yes, a pretzel bun. 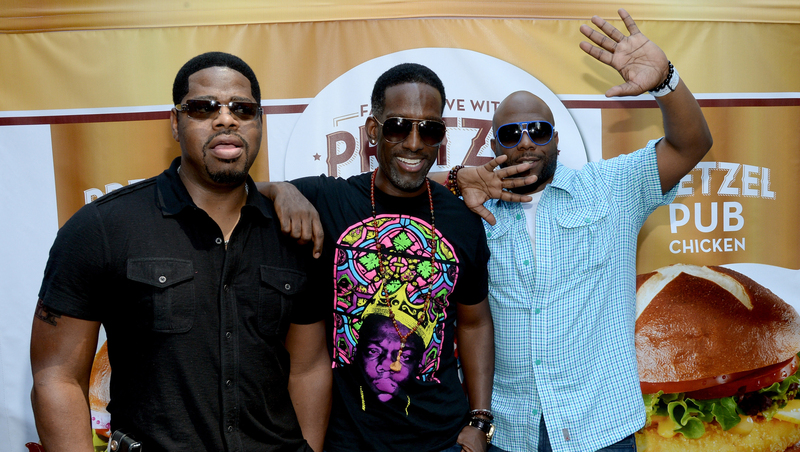 Boyz II Men took part in a creative social media marketing campaign to help celebrate the return of Wendy's Pretzel Bacon Cheeseburger and Pretzel Pub Chicken for the summer -- and it was quite funny. They also took out a little time to sing their favorite karaoke song for us, too. Check it out in the video above.